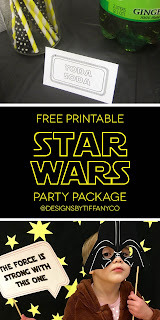 Star Wars Party Package Printables – FREE! In honor of Rogue One coming out, here is a fun and free Star Wars party package to help celebrate! I threw this party last year for my Star-Wars-fanatic husband’s 30 year old birthday party! He’s not into parties, but it was the big 3-0, so we had a party. It was so much fun creating this and want to share it with you so you can have a fun party too! Check out the photo below for what I have included in this mega party package! Get free party package printables here. Get Photo Booth printables here. Free Printable : July 10th is Teddy Bear Picnic Day!